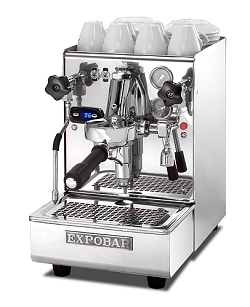 Mini Semi-Automatic espresso coffee machine with 1 group EB-61 with lever, made of bronze of the hightest quality, with connection to the water network and dual boiler system: one boiler for steam, hot water and to pre-heat the water entering to the boiler. The second boiler keeps the right temperature of water for the extraction of coffee. 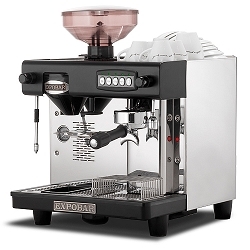 This model comes complete with the lastest generation PID sensor to guarantee a consistent brewing temperature. One steam tap and one hot water tap. 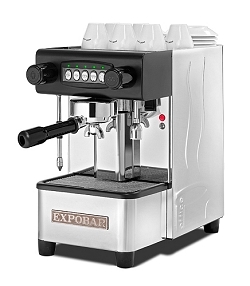 Mini automatic espresso coffee machine with 1 group, electronic switchboard to control the coffee dosages volumetrically, 2,75 litres water tank, and copper boiler with 1,5 litres capacity with heat exchanger per group. One steam tap and one hot water tap. 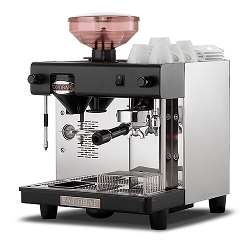 Mini Semi-automatic espresso coffee machine with 1 group, with 2,75 litres water tank, and copper boiler with 1,5 litres capacity with heat exchanger per group and cleaning valve. One steam tap and one hot water tap. 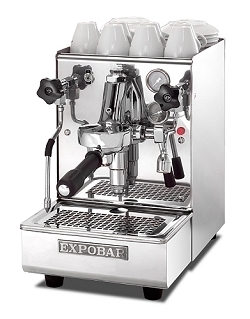 Mini semi-automatic espresso coffee machine with 1 group, electronic switchboard to control the coffee dosages volumetrically, with connection to the water network and copper boiler with 1,5 litres capacity with heat exchanger per group and cleaning valve. One steam tap and one hot water tap. 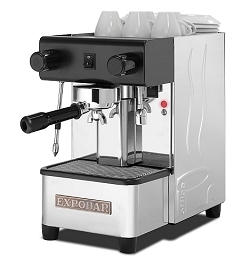 Automatic grinder, coffee cutting blades 60 mm diameter, motor 285 W.
Mini semi-automatic espresso coffee machine with 1 group, with connection to the water network and copper boiler with 1,5 litres capacity with heat exchanger per group and cleaning valve. One steam tap and one hot water tap. Automatic grinder, coffee cutting blades 60 mm diameter, motor 285 W.